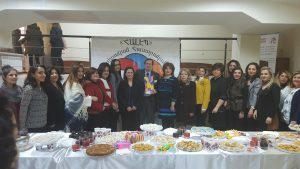 “Arevik-Armenia” Center for individuals with special needs, which functions under “Aleppo” Compatriotic Charitable Organization, is reopened with new equipment and improved conditions. 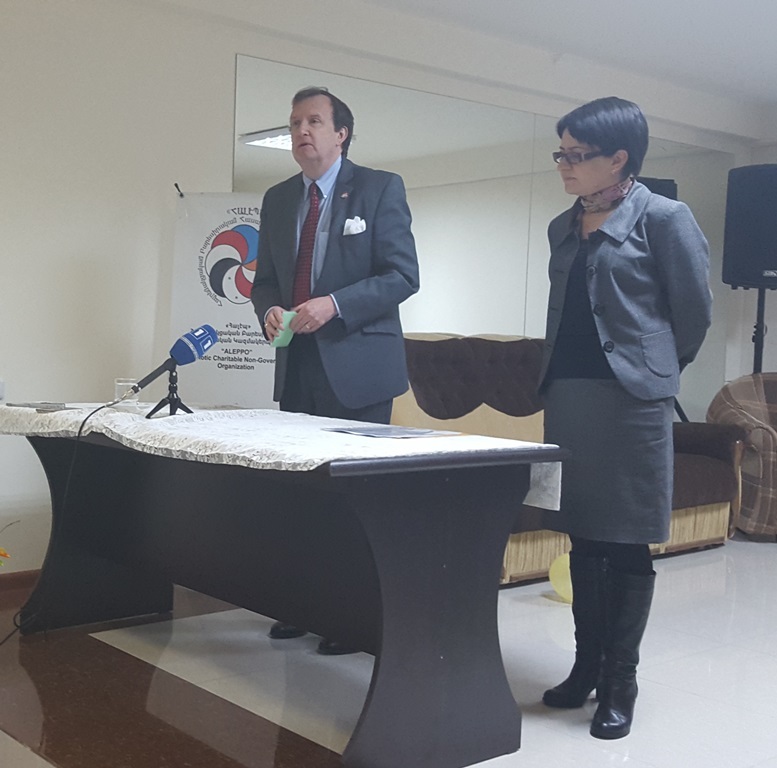 The reopening of the newly refurbished “Arevik-Armenia” Center took place on February 2, 2016. The refurbishment of the “Arevik-Armenia” Center, which included an upgrade of the facilities as well as new educational and therapeutic materials, was made possible with the assistance of the Embassy of the United States in Armenia, in the framework of the Julia Taft Fund for Refugee via implementation of the “Better Environment for Refugee Children and Adults with Disabilities” project. The project started in November 2015 and ended on January 31, 2016. 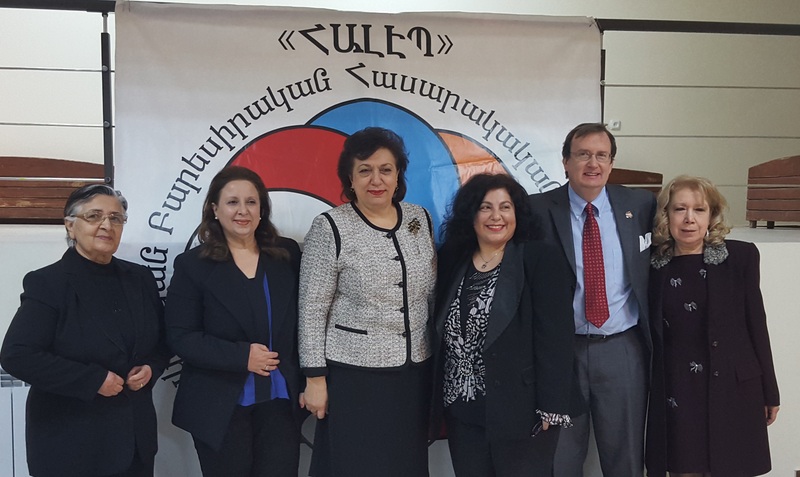 The Ambassador of the United States of America to Armenia Richard Mills, the RA Minister of Diaspora Hranush Hakopyan and Vasken Yacoubian a member of the central executive committee of AGBU as well as other international organizations honored the ceremony with their presence. Mrs. Ani Balkhian, the Founder President of the “Aleppo” Organization officially opened the ceremony with welcoming remarks. 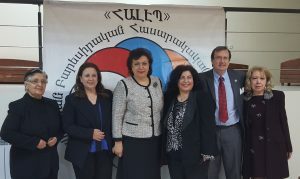 Praising the US Embassy in Armenia for their immense support to the “Arevik-Armenia” Center, Mrs. Balkhian thanked the U.S. Ambassador Richard Mills for continued and vital support. 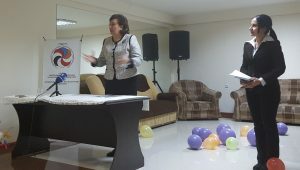 She also mentioned that the reopening of refurbished “Arevik-Armenia” Center in the Mother Land rebuilds the belief of the “ALEPPO” Organization that the prosperous World full with peace can only be created by the joint cooperation, joint efforts and unity. 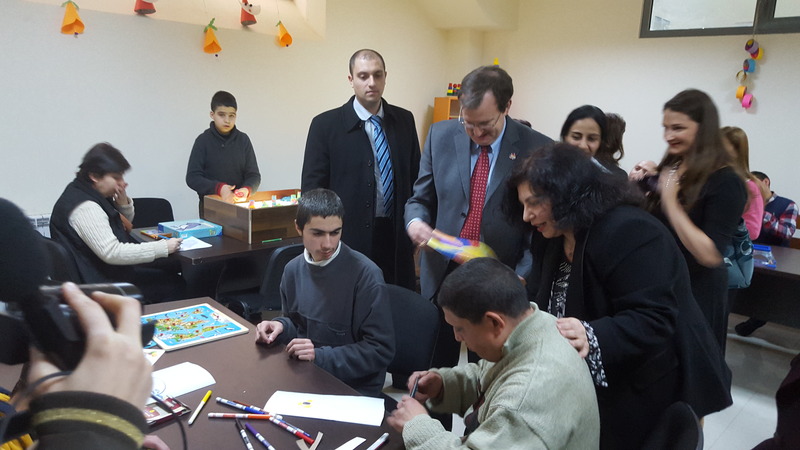 Ambassador Mills commented that “the Arevik Center plays an important role not only by helping refugees integrate into the local community, but also by helping persons with disabilities lead full, independent lives. When persons with disabilities are empowered to fully participate in the social, economic, and political life of their local community, of their country, the entire society gains. In her welcoming remarks, the RA Minister of Diaspora Mrs. Hranush Hakopyan thanked international and non-governmental organizations, the office of the UNHCR, European countries, United States, for their kindness and support in helping refugees. Also thanked the board members of the “Aleppo” Organizarion, the sponsors, organizers, educators, and all those who did everything for the integration of Syrian-Armenian individuals in society. At the end, children and adults with disabilities came up with the music performance. 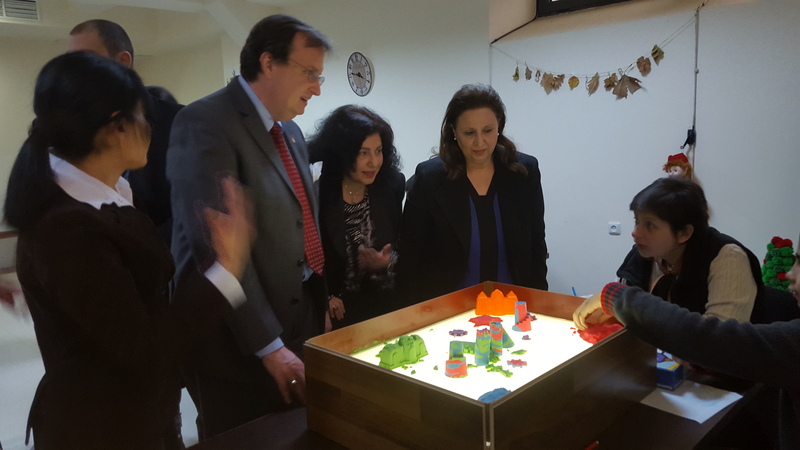 Later, the invitees and guests had the opportunity to get acquainted with the new equipment of the center. 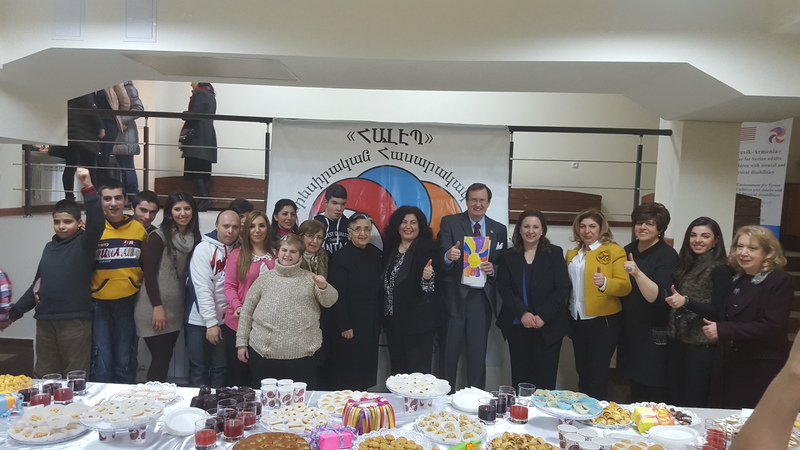 A reminder: “Arevik-Armenia” Center for Syrian children and adults with disabilities has been forced to shut its doors after 13 years of functioning in Aleppo in Syria, due to the danger of the on-going war in Syria. 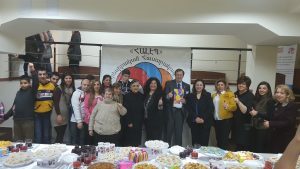 Children and adults with disabilities, who suffered insecurity and hardship, displaced to Armenia, have once again been given the opportunity to get together and enjoy the activities of the center renamed as “Arevik-Armenia”, due to continuous and endless efforts of “ALEPPO” Organization since 2014.